As the smartly dressed performers took their places centre stage, a hush instantly fell over the audience within the newly refurbished space of Victoria Concert Hall. It was thus that the three starring acts for the night – Raffles Chorale, alumni choir Raffles Singers and their Year 1-4 counterpart Raffles Voices – made a sparkling entrance for their annual arts performance Vocal Exploits 2015, immediately filling the hall with comforting, dulcet sighs of one impressive choir overlooking fully-packed turnout. Held to raise funds for Nepal in the wake of the devastating earthquakes in April, the theme for this year’s concert was Canticum in Natura (Latin for ‘Songs in Nature’). True to its name, the concert showcased a stunning repertoire variously inspired by the beauty and majesty of our natural environment. The theme took on an even deeper throughout the musical extravaganza, as the many songs recalled the joy of appreciating Nature and her vicarious gifts — perhaps an experience made particularly poignant to an audience accustomed to city life in concrete jungles. The concert started on a high note, opening with Cantate Domino (‘Sing to the Lord’) by Josu Elberdin, which pervaded the atmosphere with pleasant clarity of voices, as the singers passionately produced rousing chants, united as one ensemble. Following that, in the concert’s first half, the rest of the songs included various works centering around the celebration of the human spirit. I Carry Your Heart with Me (originally a poem by E. E. Cummings) was a gently euphonious song about enduring love, accompanied by sweet felicitous notes played by violinist Carolyn Au (16S03F). In contrast, Hentakan Jiwa (‘Beat of My Soul’ in Bahasa Indonesia) by Ken Steven was notable for its stirring Indonesian percussionistic rhythm, which Raffles Voices created through clapping and stomping when they took over the stage — evocative of the strength of a beating human heart. In Beati Quorum Via (from Psalm 119:1, Latin for ‘Blessed Are Those Whose Way’), a religious hymn, the choralists blended voices both high and low as well as booming vocals together into one resounding whole. Those present were able to hear a sundry of different languages throughout the various pieces, some comprehensible to us, some completely foreign – but they had not detracted from the audience’s enjoyment of the plaintive music and instead, as the music went on, they managed to move the audience in their seats simply through the emotional passion of the performers’ elegant voices, communicating in the wordless yet inspiringly universal tongue of music. In particular, there was Stars I Shall Find by David Dickau. With a mellow touch of piano accompaniment and spirited expression, it stood out for its optimistic message of keeping oneself afloat and finding hope amidst adversity. 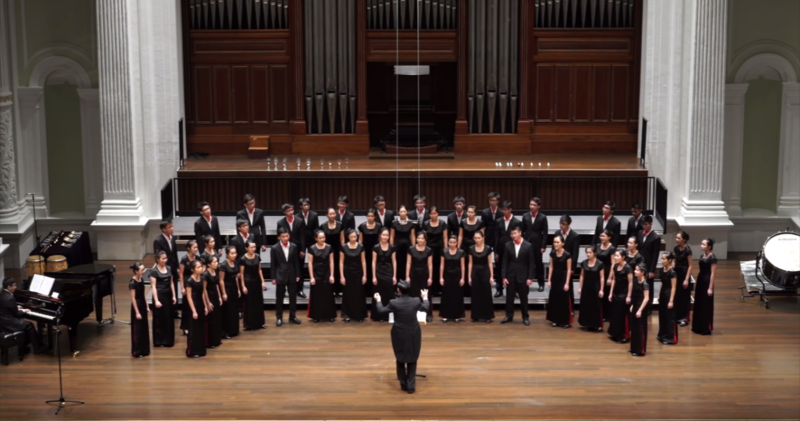 Raffles Chorale performing in the picturesque setting of Victoria Concert Hall. After the intermission, the audience saw Raffles Singers, comprising of chorale alumni, taking the stage alongside their juniors for some notable performances. There was a noticeable shift in mood due to the transition, through changes in song choice, to a lighter listening experience – while the atmosphere was still solemn during some pieces, most of the works included were contemporary pieces, which made for a musical style more aurally engaging for younger members of the teeming audience. The sombre ones – fewer in number this time round – included the notable The Lonesome Road arranged by Simon Carrington, which mixed soulful melodies with contemplative lines about solitude (“Walk down that lonesome road all by yourself / Don’t turn your head back over your shoulder”), to create a song which was deeply introspective. In their rendition of Gloria by contemporary South Korean composer Hyo-Won Woo, the performers brought to life the piece’s richly nuanced and unique fusion of Eastern musical influences with a rearranged, but still quintessentially Latin, hymn. Our choir efficaciously recreated the might and regality associated with Latin chorale music – combined with their execution of traditional Korean music tempos which had been incorporated into the song, the performance was nothing short of a rousing crowdpleaser. La Cucaracha, a Mexican folk song, livened up the whole venue with its light-hearted and jovial tunes. Pervaded by the catchy repetitions of ‘ba dum da’ that compelled one to dance along with the rhythm, it ended with a loud, enthusiastic shout of “Olé!” which cracked up many in the audience. Pamugun, from one of the Philippines’ most prominent composers Francisco Feliciano, was unfolded to the expectant listeners by Raffles Singers. It was a challenging piece better suited for the more seasoned alumni; the song (which told the story of a desperate hunter chasing a bird) tested the waters of typical concert fare, not just because of its rapid-speed rhythm which demanded much vocal agility, but also for a few surprises throughout the song, such as a loud, unexpected shriek halfway which shocked the audience. In all, it was one of the more outstanding performances, demonstrating the mastery of our alumni choristers and rounding off the concert well with a delightful dose of what was unusual. The next piece brought in several new instruments, such as a cymbal, a bass drum, handbells, and many more curious musical implements. Cloudburst by Eric Whitacre — about the breathtaking wonders of nature big and small — was an intriguing piece: snapping fingers became raindrops, a thunder sheet with the bass drum became thunder; the song slowly built a storm to its crescendo, before leaving the sounds to ebb away gradually. With a slight dream-like quality with the ringing of handbells, the audience was entranced by the thunderstorm that grew in the hall, into a storm which received thunderous applause at the end – truly well-deserved in our opinion, considering the song had been one of the most challenging of the lot to choralist Adrian Wang (16A13A), since it had been “substantially long” while necessitating the seamless “weaving together of voices and several instruments”. Last but not least, the chorale groups concluded the concert by singing the Institution Anthem upon requests for an encore, as per Chorale’s tradition. 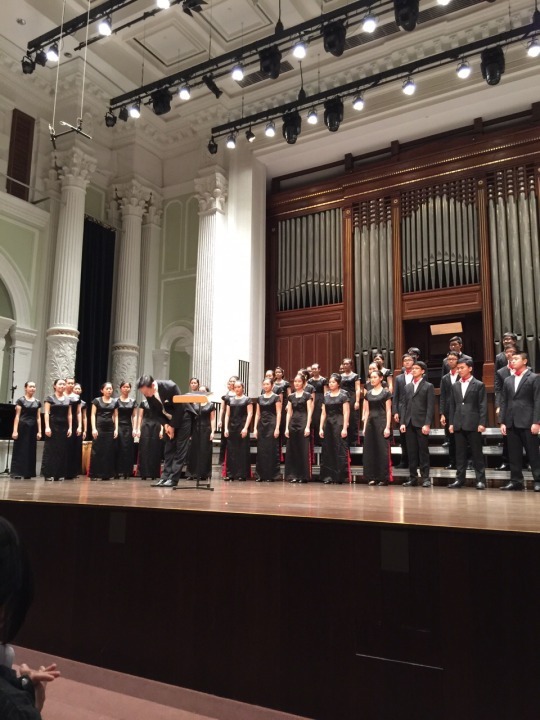 There was an invitation extended to all Rafflesians present to join in with them – which they did, boldly singing together in what was a joyous and stirring rendition of the Anthem. All attention is on the performers, as they conclude their song. For seasoned music aficionados, the originality of some notable pieces – manifest in the recreation of nature’s sounds in Cloudburst, and the seamless, yet whimsical alternation between fast-paced bars and slow cries of Pamugun – would have delighted. There had been no lack of thrills for the casual listener there either: the songs had taken the audience on an emotional roller-coaster, riding from the high of sprightly jingles, to the sobering melancholy of some sad ballads. And as for the average student there, there had certainly been some pieces with timbres mostly unfamiliar to them in this day and age (austere works such as Gloria or Beati Quorum via). Still, in the bigger picture, that mattered little because at its core, the whole affair in Victoria Concert Hall had been a sincere performance with the best mix of chosen pieces, marked by the choirs’ emotional conveyance of the human heart and soul through the sheer will of voice alone.